Bhubaneswar: Around 113kms from Bhubaneswar,Badmul is a small town in the Nayagarh district that owns a part of the infamous Satkosia Tiger Reserve. The town has been a significant tourist destination for people from around the state and and in fact beyond the state . The majestic gorge of Satkosia renders a wonderful point of interest for travellers to rejoice in the milieu of nature. 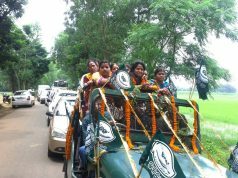 Satkosia Sands Resort is an initiative by the Mahanadi Wildlife Division of Satkosia Tiger Reserve. Within a span of one year it has established itself as a prime eco tourism destination for nature lovers and adventure enthusiasts. Located on the banks of the Mahanadi river on a hill , the resort facilitates a panoramic view of the famous 14 mile Satkosia Gorge. The forests, rivers, and endless breathtaking views have made what the visitors today call the “Satkosia Sands Resort”. There are variety of options to stay in here when you want to escape, unwind, explore, or have an adventure. From October 1 2017 Satkosia Sands Resorts will be hosting camping groups from Bhubaneswar and Cuttack. 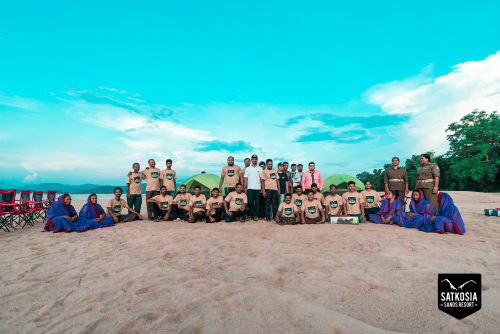 A company specialising in curating experiences “Detour Odisha” has been appointed to execute “Nature Awareness Program” with camping at Satkosia Sands Resorts in collaboration with Odisha Tourism . A night stay in the camp succeeds adventurous activities like trekking, cycling, bird watching, star gazing, bonfire, sand sports and folk dance . 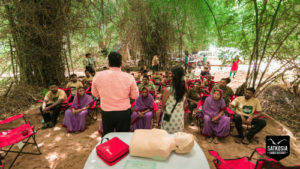 A group of 40 participants which includes members of the Eco Development Committee in Satkosia Sands Resort, Badmul along with Forest Range Officer and Forest Guards of Mahanadi Wildlife Division, Satkosia Tiger Reserve received training in “Basic Life Support” skills conducted by Apollo Hospital, Bhubaneswar as part of their CSR outreach program. The training on Cardio-Pulmonary Resuscitation (CPR) was done by a team of Life-Support Instructors from Apollo Hospital, Bhubaneswar. 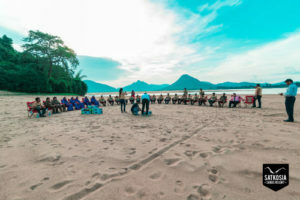 The basic training prepares the team to know how to react to life-threatening emergencies such as cardiac arrest, drowning, or choking, head injury, wounds, bleeding, fracture, muscular and joint injury, heart attack, snake and scorpion bites and heat stroke, until more advanced medical care arrives. The group also learnt how to use an AED when needed. In addition to , a team from Bangalore representing the Coleman Company, a US based corporation specialising in outdoor camping products also paid a visit to the site, to demonstrate to the locals regarding the procedures of pitching a tent ! . The EDC team actively participated and enhanced their knowledge so that they can help campers when they arrive this season. Next articleChairman, Railway Board Ashwani Lohani awards a staff of North Central Railways for alertness & promptness on duty.